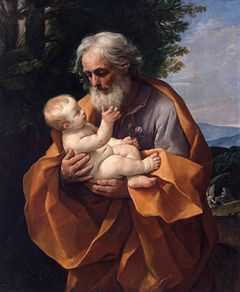 Saint Joseph’s Day, March 19, the Feast of Saint Joseph is in Western Christianity the principal feast day of Saint Joseph, husband of the Blessed Virgin Mary and legal father of Jesus Christ. It has the rank of a solemnity in the Catholic Church. It is a feast or commemoration in the provinces of the Anglican Communion, and a feast or festival in the Lutheran Church. Saint Joseph’s Day is the Patronal Feast day for Poland as well as for Canada, persons named Joseph, Josephine, etc., for religious institutes, schools and parishes bearing his name, and for carpenters. It is also Father’s Day in some Catholic countries, mainly Spain, Portugal, and Italy. It is a holiday of obligation for Catholics, unless the particular Episcopal Conference has waived the obligation. Popular customs among Christians of various liturgical traditions observing Saint Joseph’s Day are attending Mass, wearing red-coloured clothing, carrying dried fava beans that have been blessed, and assembling home altars dedicated to Saint Joseph. March 19 always falls during Lent, and traditionally it is a day of abstinence. This explains the custom of Saint Joseph tables being covered with meatless dishes. St. Joseph altars, representing the Holy Trinity, are divided into three sections with a statue of St. Joseph at the head. The devout place candles, figurines, flowers, medals and other items around the alter creating a beautiful, lush and overflowing effect. Because the altars thank St. Joseph for relieving hunger, offerings of food are added to the cornucopia that anyone is welcome to feast on during the holiday. Cookies, cakes and breads, often in the form of shell fish, are common decorations for altars. Fava beans, or “lucky beans” are particularly associated with St. Joseph because they sustained the Sicilians throughout famine. Pick some up for good luck! As tradition has it, the altar is broken up on St. Joseph’s Day with a ceremony of costumed children, pretending to look for shelter, finding sustenance at the altar. Food and donations are then distributed to the public with leftovers going to the poor.